This stole is based on the traditional shawls worn by women in the Shetland isles but with a modern twist. Knitted in one piece, the stole begins with a provisional cast-on from which the centre lace panel is worked flat. Stitches are picked up around for an Old Shale border in the round. Finally, a short provisional cast-on is made and a knitted-on edging is worked. The only “seam” required is the graft between the beginning and end of the knitted-on edging, which means no casting off! 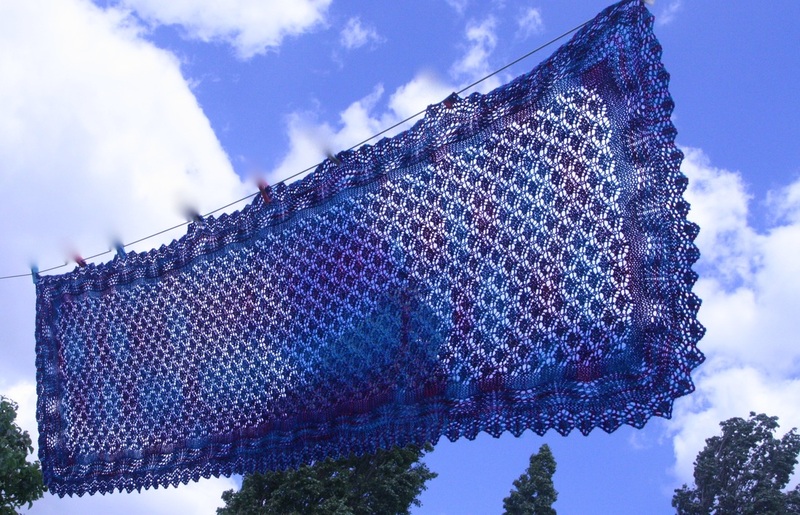 The stole uses approximately 1500 yards of lace weight yarn, and 3.5mm (US 4) needles (for working both flat and in the round). Recommended length of circular needle at least 60”/150cm. Gauge is not vital but may affect your yardage and the finished size of your stole. The pattern contains both charted and fully-written instructions (i.e. it is possible to work this pattern without using charts).